For Thanksgiving, I went to Ohio to be with my Mom and sister. I took my mom some homemade caramels from a recipe from my friend, Diana, at Nana Diana Takes A Break. Diana has THE BEST caramels recipe on her blog and I had been wanting to make them for sometime now. My sweet Mom has loved candy her whole life, and I received the sweets gene from both of my parents! I remember when I was a little girl, she would send me to the candy store (yes, just like you picture, with glass cases and all kinds of candy behind the counter), and I would bring her back some. Yes, life was simpler and somehow safer back then. My Mom always looks so pretty and I learned to make a cozy home from her. She has such a sense of style, and even at the age of 87, she still coordinates her outfits beautifully, with a pretty necklace (which she made), and a matching belt. I'll never live up to her style coordination. Mom has always loved caramels, and Diana was kind enough to tell me to share the recipe on my blog, because she's a "let's share kind of gal". To check out Diana's recipe and how she packages them so very attractively, please visit her recipe here, and tell her I said "hi"! My Mom has loved to shop at thrift stores and several years ago she found this stacked teapot/teacup set. Isn't it pretty? This is such an easy recipe for caramels, and as Diana says, "it has never failed", AND they're made in the microwave! In a large microwave safe, 2 quart size bowl, (such as Pyrex), melt the butter in the microwave. Remove from the microwave. Add the corn syrup, both sugars, and the sweetened condensed milk. Stir until mixed and dissolved. Microwave for 3 and 1/2 minutes. Carefully remove from microwave and then stir down. Return to microwave microwave for 3 and 1/2 minutes more. Carefully remove from microwave and add the vanilla. Stir gently until few air bubbles remain. Pour into a buttered 8 x 8" pan, and refrigerate until set. YUM - I absolutely adore caramels - have you ever gone to The Morgan House in Dublin when visiting here and bought their caramel candies at the cash wrap area? I always buy some after I lunch there with my sisters or daughters. Glad you had a chance to visit. I loathe the fact that you were 10 minutes away and we can never seem to get together when you are here. Oh well. How sweet that you could be with your mom and sister, and how wonderful she is still a fashion maven :) The caramels look dangerously easy! Hi Kitty, your mom is so cute and fashionable! Thanks for the recipe from Diana for the caramels. I bet they taste delicious. Oh Kitty, this post warmed my heart and brought a smile to my face. I am so glad you were able to enjoy Thanksgiving with your precious mom and sister...I am sure it was a sweet and memorable time. And your dear mom...what a lady! Just like you, Kitty. Thank you for sharing. And thank you for sharing the caramel recipe. My husband loves caramel so I think maybe I should make some of these during the Christmas season. Oh Kitty your mom is so adorable! I see where you get your crafting gene! I'm pinning your yummy recipe. Hopefully mine will turn out as delicious as yours! 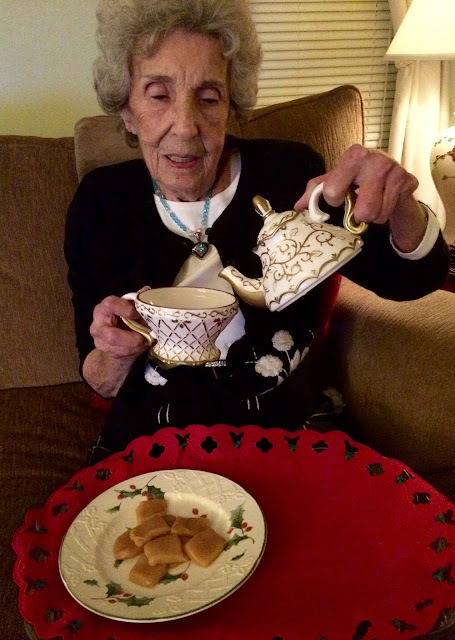 Your mom looks sweet pouring her tea and it's so nice to see a woman of her age still dressing, and looking nice. An inherited sweet tooth here too - can you imagine afternoon tea without a goodie on the side! What a sweet photo of your mom (no pun intended). The golden tea for one set is lovely. I may try out the caramel recipe during the holidays (and we'll see if it's still fail-proof. HA!). Thanks for sharing, Kitty. OH.MY.GOODNESS! You've been reading my mind. I've had my favorite - CARAMELS - on my brain for days now. I'm going to make these! Lovely post...sure love the photo of your mom pouring tea...perfect! I'm sure you had a glorious time making memories with your dear mama. Thanks for sharing this recipe! I plan to make them very soon. That is one of the prettiest stacked teapot/teacup that I have ever seen, quite classy. Kitty, Your mother is so pretty! Her outfit and necklace are lovely! And I love the stacked teapot/teacup set. Hi Kitty, Oh your mom is so pretty and you take right after her too. I love the photo of her pouring the tea from that gorgeous tea for one set. The caramels look so good and I have printed the recipe. Diana is always the best and yes she is giving and sharing in all she does. Thanks for passing this along. Glad you had a nice Thanksgiving and time spent with your dear mother and sister. Sounds like a perfect Thanksgiving! The caramel's look very good. I love the story of you going to the store to get candy for your mom! 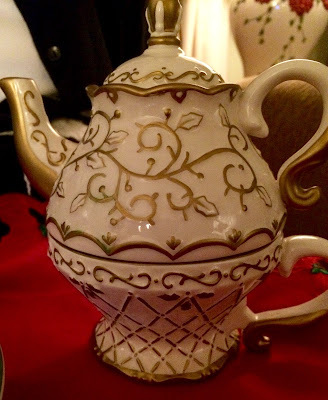 I am so impressed with how stylish & sharp your Mom is at 87 (as I sit here in sweatpants & turtleneck) She looks simply wonderful pouring tea from that lovely pot & cup for one. I love those! The carmamels look luscious but I better not make them...I'd eat them all myself. I shall save the recipe for when I need to bring a treat someplace. Thanks for sharing Diana's recipe. Your mom is so cute. My grandpa used to make these along with Peanut Brittle for Christmas. It was so good. How sweet to be with your Mom. She looks so lovely and I love her sense of style and also that she loves to thrift. You are a lucky girl to still have your wonderful mom. I'm sure she enjoyed those caramels! What a sweet photo of your mom. I'm glad you could spend the holiday with her. Caramels are one of my favourites! I am blaming you, Diana, and your beautiful mom, too, for the pounds I shall gain from making this recipe today. I've already made Diana's French Toast recipe and, if that is any indication, this is going to be amazing. Beautiful picture of your Mom and her teapot. I thought about you while you were visiting your sweet mother and sister. Know it was special. Now, I'm craving caramel! If it is a no fail recipe I will try it. I have failed caramel icing before! Nice of Diana to share her recipe. Glad you are home safely. Blessings to your Mom. How nice that you are spoiling your mom. I do love the idea of an old-fashioned candy shop. Caramels are one of my favorites and I make them every year. I think Dian's recipe is the same as the one I use. They are so yummy! Your mom is a gal after my own heart! I have a sweet tooth as well. Thanks for sharing with SYC. Oh Kitty, your mom is just so cute. She is the same age as my dad. I love that she gets all dressed up. The caramels look so yummy. Have to pass but enjoy the pix. Happy December. How sweet to share Diana's recipe and see how much your Mom is enjoying this treat. She is very lovely! Love the necklace too! Thanks for sharing. Looks like you had a great visit with your Mom over Thanksgiving. 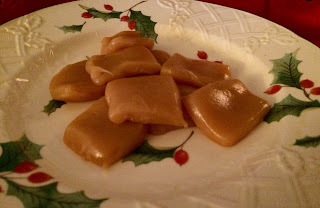 Your Caramels look great and it looks a lot like the recipe that my Granddaughter and I made over Thanksgiving. Hope you are having a great weekend and thanks so much for sharing with us at Full Plate Thursday! What a neat recipe! They look so yummy! Kitty, your mom is lovely -- I want to look like that when I'm 87! I'm not a candy fan myself, too sweet for me, but I appreciate having a good never-fail recipe like this on hand to make for others who are. And if I were a candy eater, caramels would be my candy of choice. We were traveling last week so I was not able to look at blogs, but I am so glad to meet your sweet mother by your kind words for her. She is truly a charming lady and has a great sense of style! How wonderful you were able to visit with her and make those delicious looking carmels! Have a wonderful week ahead! Kitty, I've never made caramels but they are a favorite candy for me. I bet your mom loved that treat. Glad you two were together for Thanksgiving. I was so excited to see an easier recipes for caramels because they are one of my holiday staples, but we don't own a microwave. You must think we are totally deprived with no microwave or crockpot. I can see where you got your charm! Thanks for another great recipe. Yummmm... my mom loved brown sugar anything and loved candy. Thanks for sharing your sweet story and sweet recipe on Monday Social. How precious is your mother and she is beautiful. Those caramels look amazing and I am sure your mother enjoyed them. Thank you for sharing at Dishing it and Digging it link party. Oh I love seeing what your sweet mom looks like! She's beautiful. Diana always has good stuff on her blog -- I pinned this caramel recipe. I've never made caramels but these certainly look easy to make and worth trying!